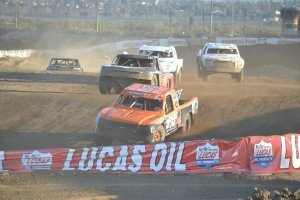 A total of 12 separate classes opened up the 2019 Lucas Oil Regional Off Road Series, presented by Kartek, at Glen Helen Raceway March 17. Rain had delayed the original opening set for February 16-17. A first was the event was held on Sunday after the Pro series was held the night before. A lot of confusion was present in this first attempt at combining the two events but the Lucas Oil personnel worked wonders and both events took place. The Fabtech Pro Lite/Pro Open fielded nine trucks with Dylan Cochran dominating the race and capturing the win. Kyle Knott earned second and Jax Redline was third. Trey Gibbs captured the Pro Buggy win over Matthew Brister. Crossing over third was Brandon Blyth. Dustin Nelson brought his SR1 out for the Weller Racing SR1 Pro/Pro AM event which had 13 starters. Nelson topped the podium with Paul O’Brien second and Nick Peery third. Matthew Brister took the checkers in the Limited Buggy/1600 Buggy race. Gunner Kennedy was second and Joe Whiteley was third out of a field of eight cars. The Steel-It Production 1000/Production Turbo/Unlimited UTV event had 14 entries with Eliott Watson taking the overall win over last year’s champion Corry Weller and Dustin Nelson was third. The Mini Stock class had nine entries with Ryan Venegas taking the win over Alex Kiss. Audree Wardrip was third. With 18 Modified Karts lining up the fans were in for some action and the front runners provided plenty of it. Mason Prater, Braden Chiaramonte and John Holtger were joined most of the race with Bronsen Chiaramonte. The four were in each others show most of the race that saw Mason Proater hold them off for the win. Braden Chiaramonte was second and John Holtger third. A total of 18 cars entered the AM Ortega J1 Kart race. Cole Gamma would end up taking the checkers over Talan Martin and Maverick Openshaw was third. Ethan Groom won the KB Engineering RZR 570 class with John Koltura second and Chase Mankin third. Mason McCarthy stood atop the podium in the Mini Open/Open V8/Desert Buggies combined class. Bradley Morris was second with Brian Cannon third. The Cylex Signs J2 Kart class had 26 entries and at the finish line it was Karaston Hernandez taking the win over Cade Martin. Chaden Zane Minder finished third. A total of 18 RZR 170 rolled on the track. Travis Sallee turned best time while taking the overall win. Jaxton Lambert was second and George Llamosas was third.